The Illinois College Republicans have come out with a report that details their early results of the group's new expansion effort in the run-up to the 2014 elections. And the results are outstanding. This group of operators is doing all the difficult work to pull the Illinois Republican Party out of the quagmire we're in. They're recruiting new folks and are being smart about their process. "The work our College Republicans are doing in this state will help us close the traditional gap in the youth vote and help the GOP to victory." You can see their full report here. For the ILGOP to succeed, we need folks like the College Republicans to be building the base and building a strong organization. They started the fall semester with 17 College Republican Chapters and now have added 13 new ones in just six months. And...importantly, 1800 new members. The critical piece of this project is that they did the outreach and grew the organization NOT during the election process/season, but rather in the year leading up to this critical campaign cycle. Former Chairman Mick Paskiewicz added, "It was really critical for us to build our organization to be in position to with the youth vote before the campaign season - not during it like we had in the past. 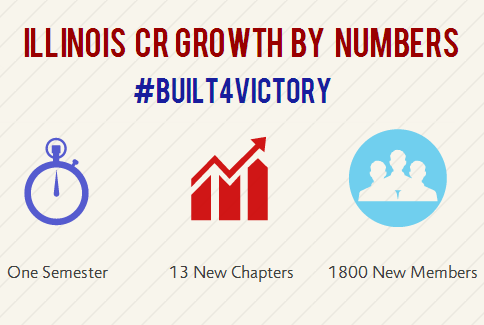 We put a program into place geared towards that goal, and while we still have vital steps we need to take, I'm really impressed with what Jesse and CRs across the state have done."